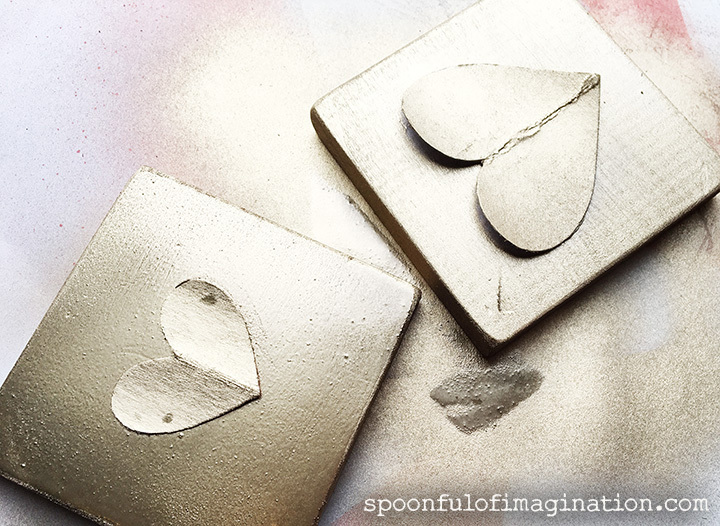 Have you ever wanted to paint a heart? Getting both sides of a heart symmetrical while painting can be intimidating. When I have tried to paint a heart by hand, often one side gets larger as I try to perfect it. By the time I go back and forth from working on the different sides, the heart ends up being way larger than I intended. 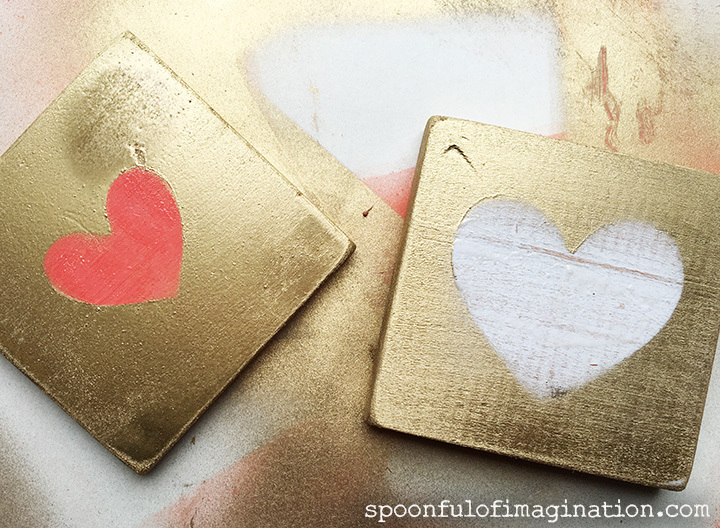 I came up with this shadow painting trick to paint hearts, and I can’t wait to share it with you. I started by grabbing a bunch of scrap wood pieces. You can use canvases or paper too. Use what you have and have fun! I used some leftover spray paints and sprayed just the top of my wood pieces. I didn’t need the sides covered or for the whole top to be really even. I was just trying to cover the middle of the wood piece well. I will show you why. After I painted the tops, I sanded my signs a little with a heavy grit sandpaper. I wanted the color to be mixed a little with a rustic appeal. By sanding the signs a little, some of the color was removed to show the natural wood below again. This next step is how you get your symmetrical heart. Remember the old elementary school trick of folding a piece of paper in half? Cut one rounded half of your heart, unfold it, and ta-da… perfect heart! 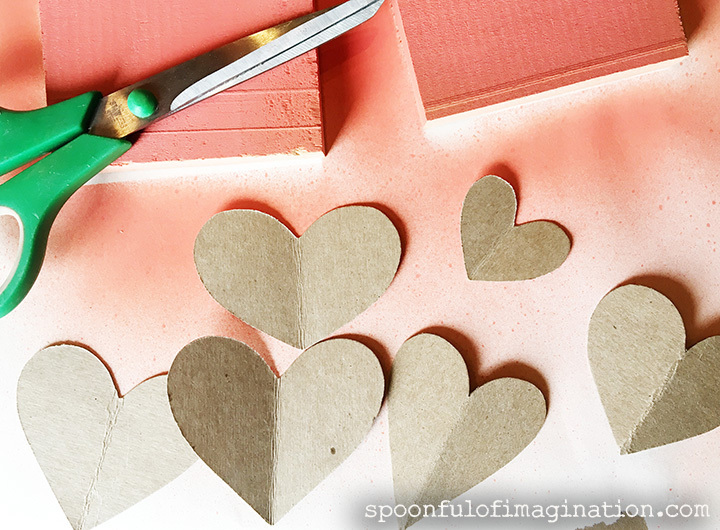 So, I cut a bunch of hearts out of thin cardboard. 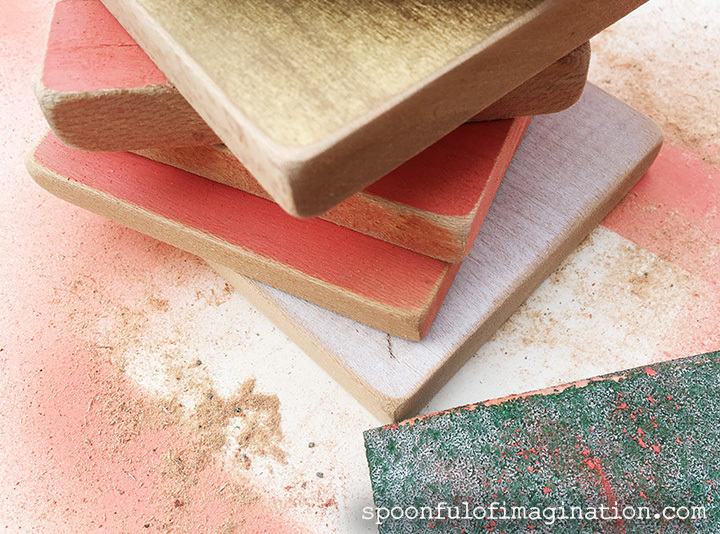 You could use construction paper or even paper bags from the grocery store. Just something that will withstand a little spray paint. The hearts were different sizes and styles. 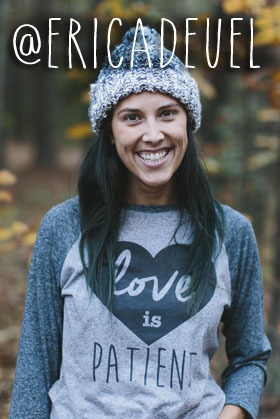 I wanted a mix of different looks, and the different hearts helped create that. 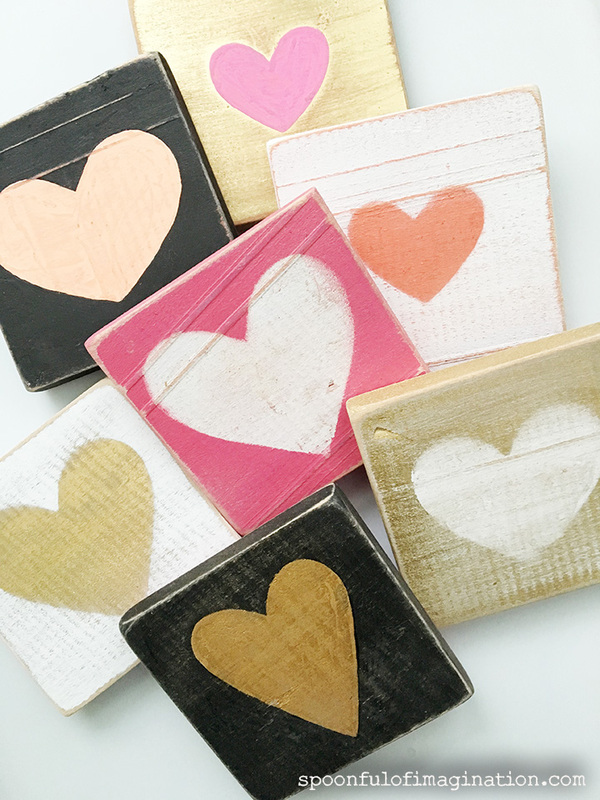 Now, I laid a cardboard heart on each wood sign and spray painted over them with a different color. The heart cardboard acted as a sticker shadow and allowed the new spray paint color to stay off the previous spray paint layer in the shape of a heart. Since this layer of spray paint is the top layer, you do want to spray paint the sides of your heart sign now. My hearts were pretty perfect. I did a light sand job to rough the edges up a bit more and then the signs were complete! If you have been following me for a while, you might remember I did this painting trick on magnets before too! 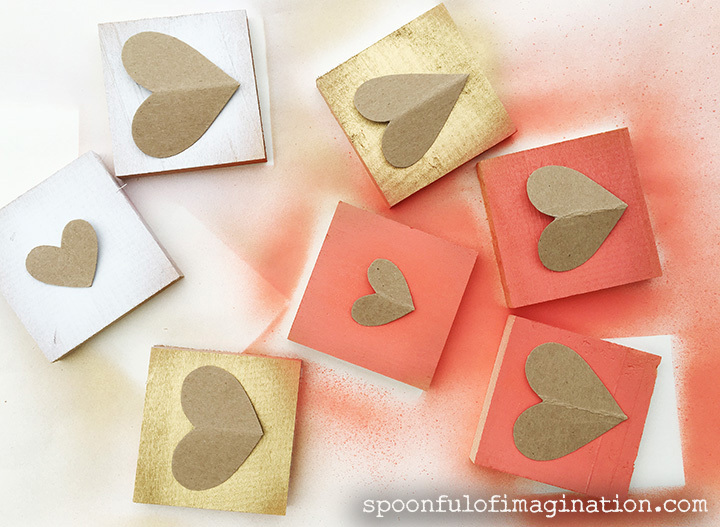 I think these would be so pretty in a gallery wall display, sitting on a shelf, or even given as a Valentine! Do you give out Valentines? Matt and I aren’t a big Valentines Day couple, but I have created a number of different Valentines for our kids through the years. This notebook valentine was one of my favorites. It’s non-candy and can be used practically after Valentines Day has passed. 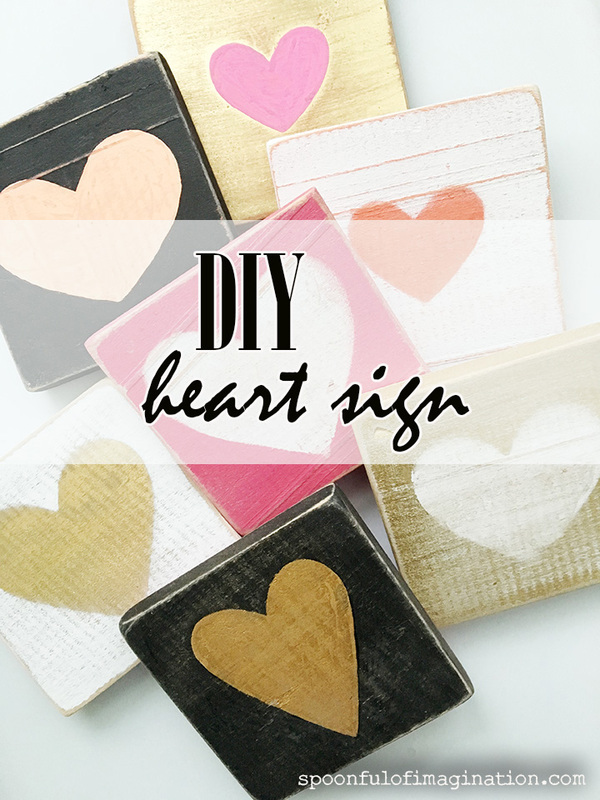 Which is also what I also like about this wood sign…a wood sign with a heart is timeless! So, I might have to take a sharpie and write a few notes on the back and give these to my kids and friends this year!?! What do you think? Would you try this technique to paint a heart? 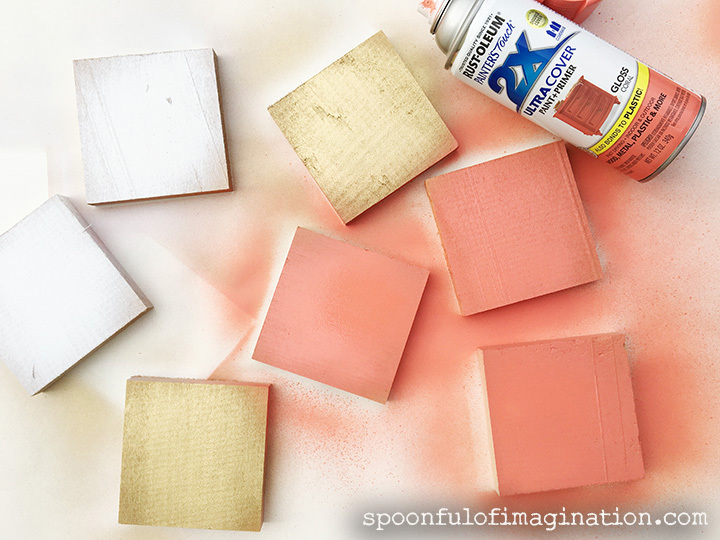 You can personalize this craft in so many ways. Changing the color is one way to personalize it to your taste. 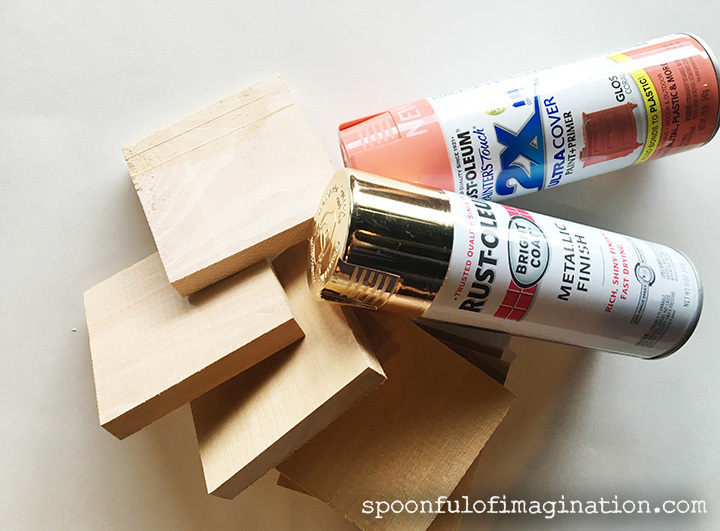 If you have scrap wood and spray paint too, then this craft is practically free! Enjoy! 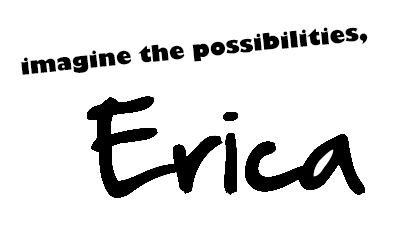 If you create some wood signs, I’d love to see them! Tag me with #spoonfulproject on social media, so we can all see your creations!